Free shipping. Buy direct from HP. 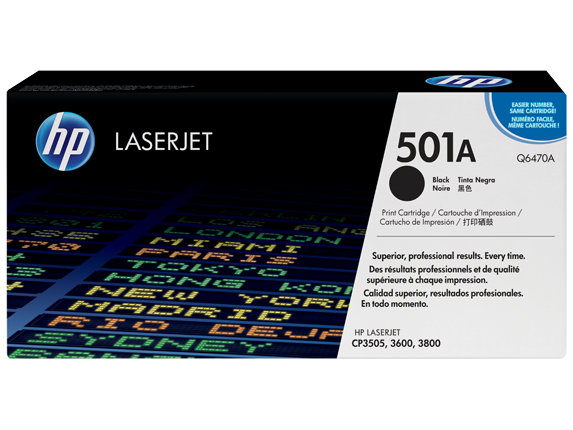 See customer reviews and comparisons for the HP 501A Black Original LaserJet Toner Cartridge, Q6470A. Upgrades and savings on select products. Sharp blacks and brilliant colors, fast and easy. New HP ColorSphere toner is tuned with the printing system to optimize quality and reliability. When hassle-free, photo-quality printing is this easy, you're more productive and that's real value. The HP printing system is tuned to HP ColorSphere toner, ensuring brilliant results and consistency.Legendary HP quality and reliability ensures high-quality results, every time you print.